Night had only just fallen, and the character of the terrain around them had changed markedly. Gone were the rolling green hills of Parth Aduial, the lush green grass having grown patchier and patchier, mingling more with the coarse gray-green grasses of the downs, and thickets of gorse and heather ringing the ubiquitous tumbled-down chunks of white rubble. The ground underneath the meager vegetation was stony and hard, flinty rock to which the grasses clung feebly. Where the trees that dotted the slopes had previously been verdant and healthy, here they began to look sickly. More and more of them were dead, bleached like the bones of skeletal hands, twisting upward in the pale light. The light of the moonrise spread around them as the party rode eastward, casting long, pale shadows on the road they left behind. The early summer warmth had faded from the day, and the chill had drawn the moisture from the air, a faint mist beginning to rise from the ground, swirling about the feet of their horses. 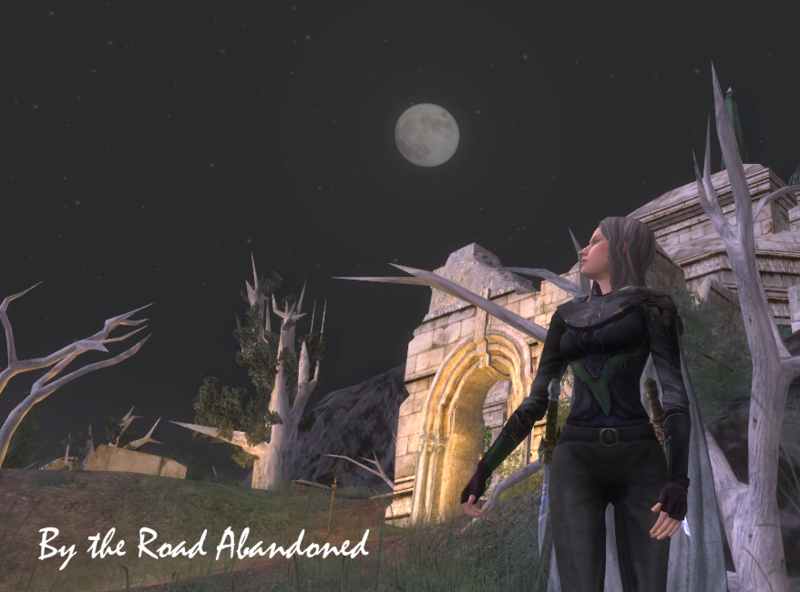 In point of fact, Llythne was beginning to realize that she’d never come this far east, and never at night. The region bordered on eerie, and the burglar felt the flesh at the back of her neck tighten slightly, drawing taught all the way up to her scalp as she shivered. Brassica was, naturally, completely oblivious. It wasn’t that Llythne had never had occasion to come out this way. Though truth be told, most of the reason she hadn’t was owing to the fact she’d always managed to contrive an excuse to avoid doing so. Here the hills that rose around them were different–as though the gentle green swells had had their outsides stripped away, to reveal walls of cold, dark stone beneath, deeply cracked and pitted, and surmounted by crowns of the bone-white trees, rooted in thin gray soil. These crags narrowed to enclose the road that cut through them, a track not often taken, and it’s white flagstones now a pale memory beneath layers of dirt, muting the sound of horse hooves as they passed over it. Truthfully, in the dark and the cold and the slowly rising wind, the only bright spot to be seen was the ruin which was their destination, an old watchtower atop a hill beside the road, its western face kissed by a the light of a fire, from which a small curl of smoke rose slowly in the dark. Llythne reflected, as they drew nearer to the ruin, that it might well be the last time she slept in one of the keeps of the Old Kingdom, if she decided to continue along with Beldrieth and Celebarad, wherever their journey might take them. In fact, she went so far as Trestlebridge, Llythne realized that she might, for the first time in her life, sleep in a building that was less than a century old. She chuckled to herself at the notion that this was a good enough reason to continue along with the journey, at least as far as Trestlebridge, and Brassica took this to be in response to one of her comments, and giggled as well. “To be sure,” Llythne agreed, reining in her mount up behind Beldrieth and Celebarad, who had stopped a respectful distance from the Ranger on the hilltop. The man was hooded and cloaked against the evening’s chill, but his face was unmasked, and Llythne was pleased to see this. To often did the Dunedain hide their faces from strangers, and in Llythne’s opinion it did nothing to endear them to common folk. His face visible, Llythne could see that he was not a Ranger she knew, and made a brief appraisal of him. He was her senior by perhaps a decade, if he wore his age truly, and did not look young or old for his years. He had a rather narrow face, and a jawline shadowed by a few days growth of beard. Lines wrinkled the corner of his eyes, though his face was stern, Llythne had the impression that this was merely because he was required to be stern, facing strange travelers at the gate he guarded, and that if circumstances were different, he’d have been smiling. “I like him,” Brassica whispered to Llythne, as they crested the hill and passed through the walls of the Ranger’s small camp. It was a neatly arrayed outpost, a stout little tent pitched above a bedroll. A barrel of fresh water, from which the ranger was filling a battered old kettle, and a small stack of crates made a leeward wall, where the camp was not enclosed in by the walls of the old watchtower. A fire crackled merrily in the center, and once the kettle had been secured on a tripod above the flames, he went to a pile of firewood, to draw over a few logs for his guests to sit on. The elves had dismounted, and Celebarad was gently stroking the nose of his mare, and talking softly to her in Elvish, as Beldrieth hobbled both their mounts.